So sad. Thank God, for now there will always be another concert. We’re doing Bach’s Mass in B Minor in the spring. This may be my favorite piece of all time to sing. 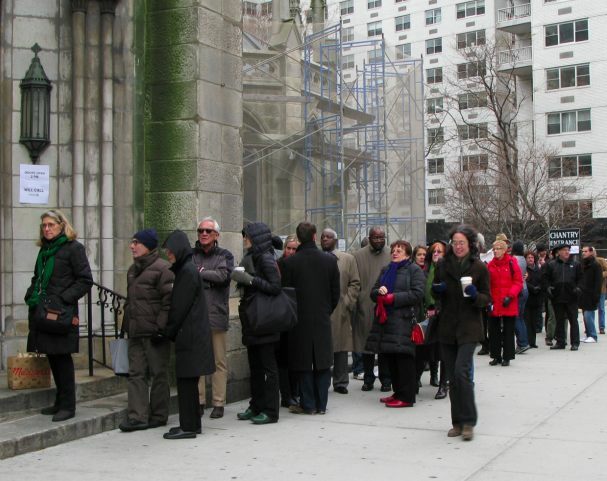 Here was the line for our Saturday matinee concert. This was an hour before the concert! We have fans! I also made a really short movie of the concert. Just a few behind-the-scenes snippets. One day I will come to New York in December to experience the city all dressed up for Christmas, and I will plan the dates so that I can see one of your concerts! I am surprised you didn’t get in trouble for having your camera “up on stage” but am so glad we get to see what it is like for you in the choir. What joy. I can see why you love it so. I was mostly discrete about the camera, but I was nervous about getting in trouble too!